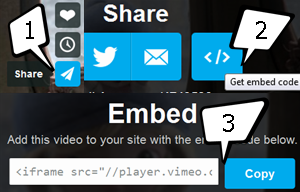 There is three ways you can show your Vimeo video. After clicking 'Html' paste configured following code, and get back to ‘Compose’ part. Vimeo is a new trend of playing video on your site; its player frame is more beautiful than YouTube’s frame (HTML5 and cross browser supported), quickly add to favorite, watch later option. So embed your Vimeo video on your Blogger blog easily, any feedback leave with comment. Goodluck….